Cafe des Ignorants, Bologna 1997 Photo Nanni Angeli. 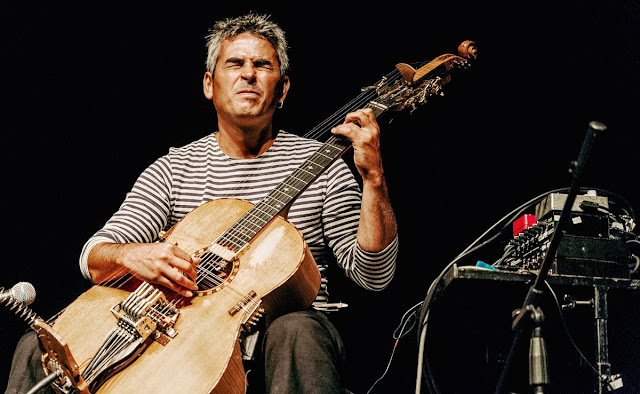 Paolo Angeli, born in 1970, started to play guitar when he was 9. He grew up in Palau, in the tialian Sardinia, an extremely stimulating musical environment. The guitar and the voice of his father, his first mentor, the autobus with the drums, the chicken, the melons, the ‘diroccati’ rock groups in an old carpentry, the experiences with concerts in the squares and carnival evenings, they all directed him towards a sailing without stylistic barriers in the world of music. who, by unblocking the barriers among musical genres and by practising collective composition and improvisation, started becoming famous in the main European festivals of innovation music. In 1995, he released his visionary album Dove dormono gli autobus, (played live on 1997 by the band Fraìli). 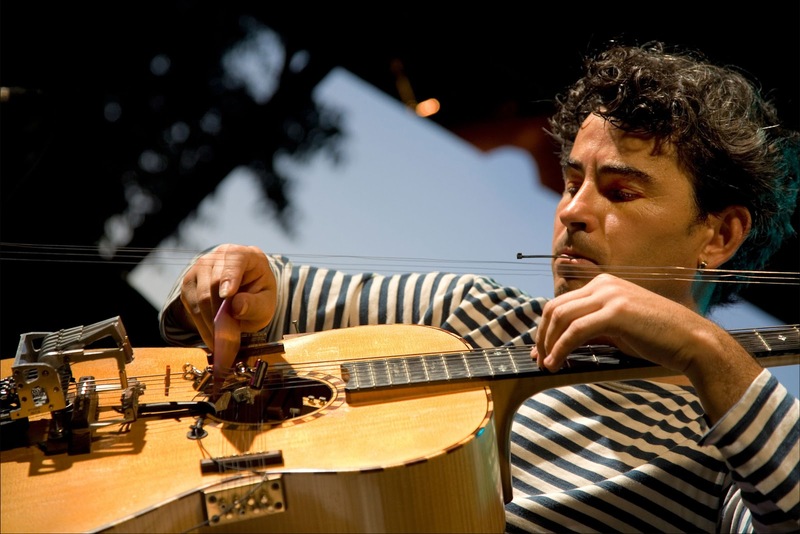 In 1997, he won the competition Posada Jazz Project and recorded Linee di fuga, the first work with his modified guitar. In 2003, he published Bucato, the synthesis of four years of concerts all over Europe, a live ‘Solo’ CD produced by the English label ReR. Then, he started touring in Canada and the United States, a period of tournées immortalized by the live publications Mede e Drawing Circle. In the same year, on request by Pat Metheny, he started the project of a new model of his Sardinian prepared guitar; in the Liuteria Stanzani it was two guitars that were born, one of which was adopted by the American musician. In 2005, for ReR, he realized Nita, l’angelo sul trapezio, an imaginary sound track as a result of the participation of most of the musicians belonging to the Bologna creative scene. Nita represents a synthesis of the creativity of the collectives and the freshness of the traditional Sardinian music. 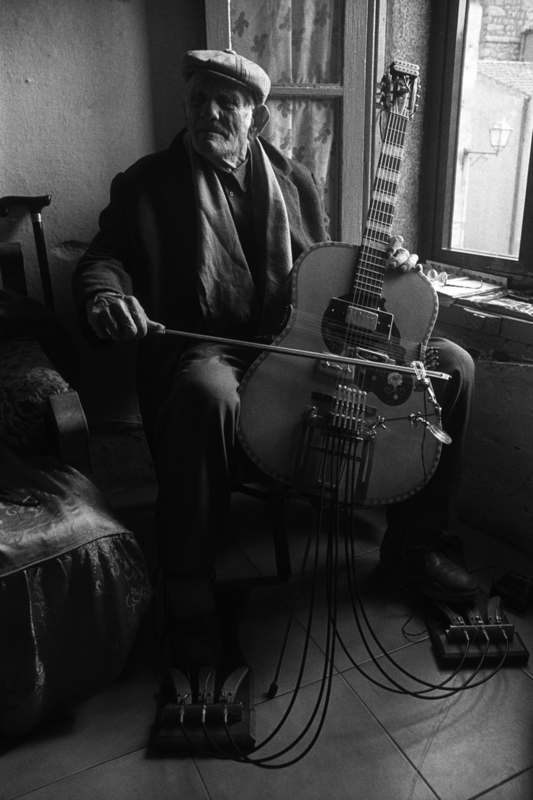 It follows a pearl in his production: the dualdisc Tibi (2010 DVD/CD), based on a photographic reportage of the prepared Sardinian guitar, realized by Nanni Angeli and sonorized live in ‘Solo’ with a music suite which includes new compositions and tracks taken from the preceding albums. 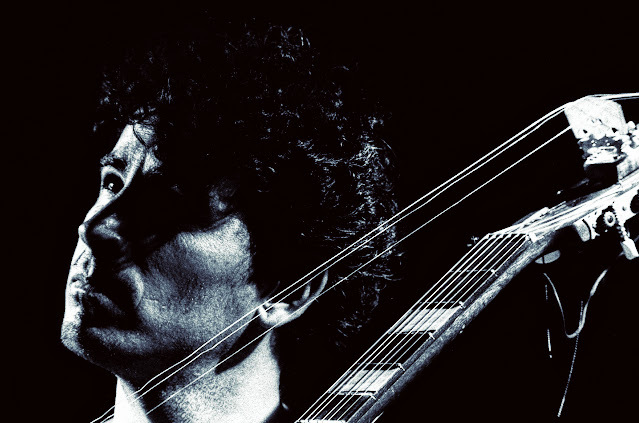 The work can be defined as the most important synthesis created by Paolo on the prepared Sardinian guitar, with a avant-garde mixing in 5.1 and with a relation to the image taking us back to the works of LM&I. 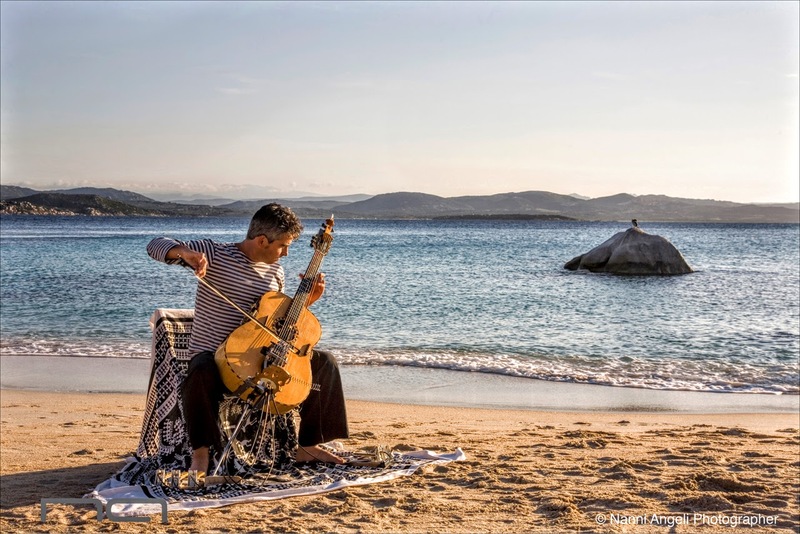 In 2013 Paolo produced his definitive meeting point between Sardinian traditional music and mediterranean influences Sale Quanto Basta (ReR), followed by his B side S'Û on 2015. 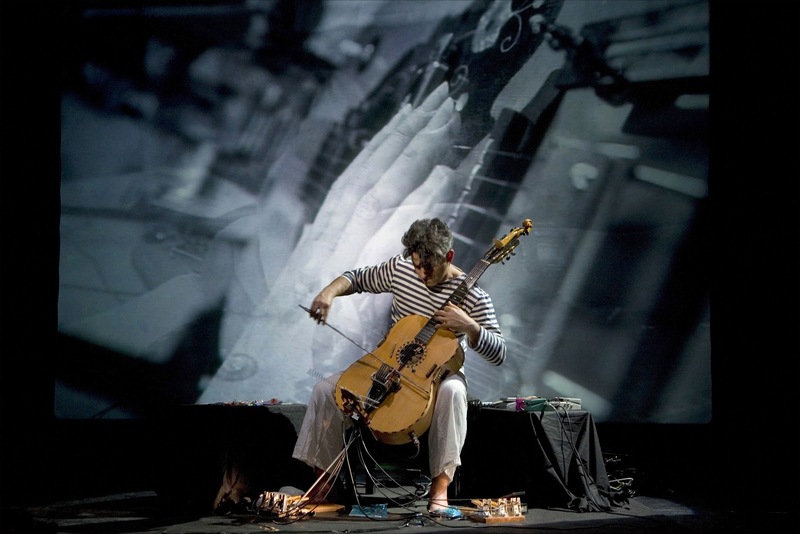 Among his artistic collaborations, it is to be remembered the multimedia projects with Nanni Angeli (Tibi, Il passo dei Misteri), the duo with Hamid Drake (Uotha Nubop 2005, Deghe ReR 2014), the avant-pop duo with Takumi Fukushima (Itsunomanika ReR 2011), the POG Trio – Piccola Orchestra Gagarin, with Sasha Agranov, cello, and Oriol Roca, drums – (Platos Combinados, WAJ/ALU 2011), the trio with Evan Parker and Ned Rottemberg (Free zone Appleby 2007), and also with the incredible czech musician Iva Bittova. Since 2009 the collaboration with Antonello Salis (Ma.Ri Auand 2003), and Drake took on the formula Trio, and in 2010 it was born the quartet that includes Gavino Murgia (Giornale di Bordo, Egea – Sard disc 2011). It was my father's one. With my brothers, we used it in a not conventional way: one seated on the guitar and the other take the neck, like a small "carrito", a little house car. Probably this funny imprinting explain a lot about my freedom playing guitar. The first was the 45rpm Don't stand so close to me (Police), the last one it's been 7 albums of Tom Waits and Vurnicula of Björk. Each one is connected with a different period of my life. An album is like a son. It always surprises yourself. Probably, Sale Quanto Basta has been a cut with the past and let me feel a Mediterranian man. S'Û follow in that way. But in the moment I recorded them, I loved all my albums. It's a necessary medium between the mind, the instinct and the instrument. Technique is important to translate as fast is possible what happen inside of your body (stomach and mind) and translate it on your own instrument. Doesn't exists. It depend about the relation with the musician. 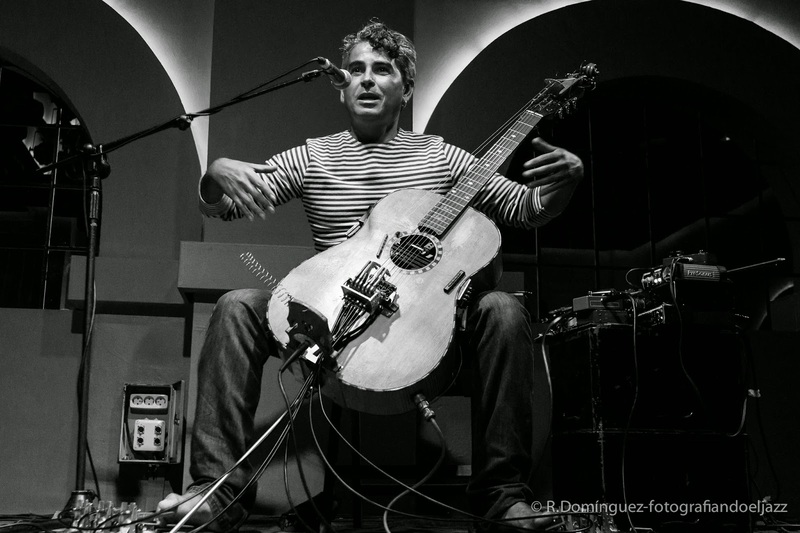 I played live for 10 years with a cheap sardinian guitar I payed 150 euros. 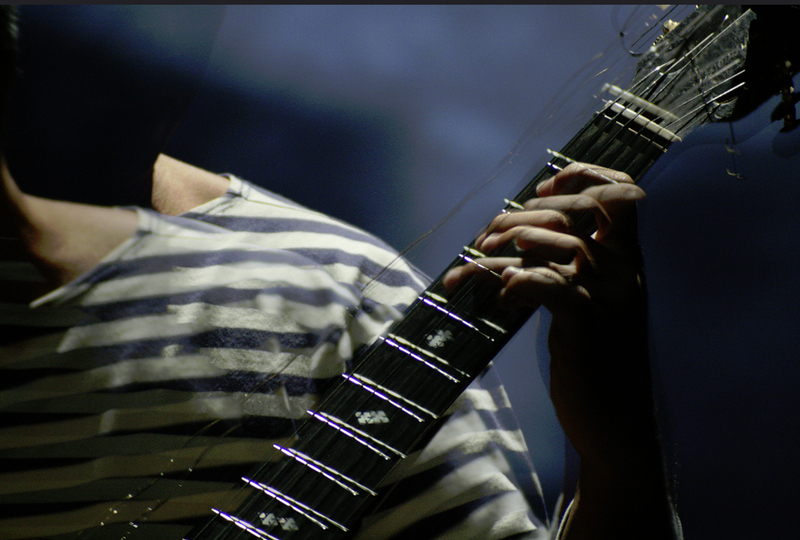 After the 7th fret it was not temperate, but I loved so much that guitar. And my first guitar, I payed 60 euro when I was 11, it's still my favorite one to play in front of the sea. She have not a lot of volume sound, but every time is windy she start on vibrations and the strings plays like in larsen electric guitar: it's incredible! She knows all kinds of winds. It's a great opportunity to arrive in touch without a production of a label and a business work. Now major and independent labels starts from the same level. With social and digital distribution, you could arrive in touch with a lot of people. It's great. You could record with low budget and arrive in the digital world. In a way is a democratic process really changing the world. On the other side is very difficult to say: HEY! I'M HERE! I mean...with so many musicians sharing the digital space, it's difficult to reach resonance. Order is harmony between different elements. This mean you could have one chord, a nice melody, a noise and you could organize it like a painter, looking for your own order. You know I love archeology? I arrive from Sardinia, a land where since 4000 years a.c. People have already developed a different kind of culture in Mediterraneum. Since then they have produced wine :-) My motivation is to continue to discover music, to learn different musical languages and then use only what I really love. I think to play is a big privilege and to study is the best option we have to follow surprising ourselves. 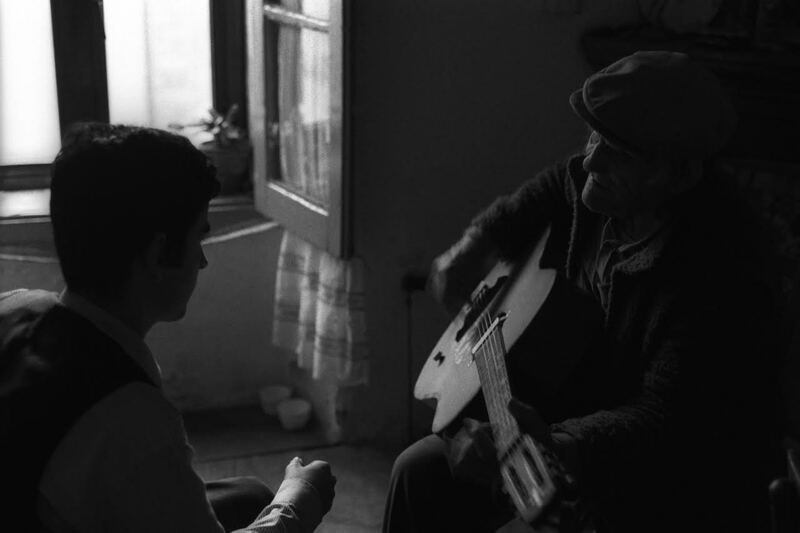 To learn traditional music from the older guitar player in Sardinia Giovanni Scanu (when I met him he was 85). I spent nine years learning the old way to play traditional music. Same singing music for holy week in choir of four people. It's something really amazing to sing with the best old singers and learn all the small details on melody and complexity in verticality with the other voices. Same than to create my guitar, It' a working progress that never stops. Every time I go to the luthe maker, this make my day. Piccola Orchestra Gagarin! I love this trio as it's totally open. Sasha Agranov plays Cello and arrive from Baroque music, Oriol Roca plays drums and arrive from jazz and electronic. The trio is a cross over between all kinds of music. We always improvise the shows and we use a crazy post soviet imagination, a kind of kitch approach and an exploration of an imaginary adventure in the space dedicate to Gagarin. When I met Fred Frith in a workshop on 1993... I was playing in an ensemble of about 28 musicians. All people were so happy, but I couldn't find a space inside the orchestra: everything I did, sounds to me poorly. 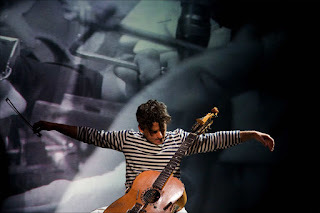 Then Fred, during the concert, let play the orchestra a crescendo at so strong volume and say: PAOLO! SOLO! I played noise for 1 minutes and Fred started laughing. It's been the first time I played aggressive music as I felt aggressive inside of me. There was not separation between the emotion and the sound. I just spend time playing vis a vis with my guitar, looking for sounds, melodies, chords, coordination with my body (as I play by foot like a drummer). 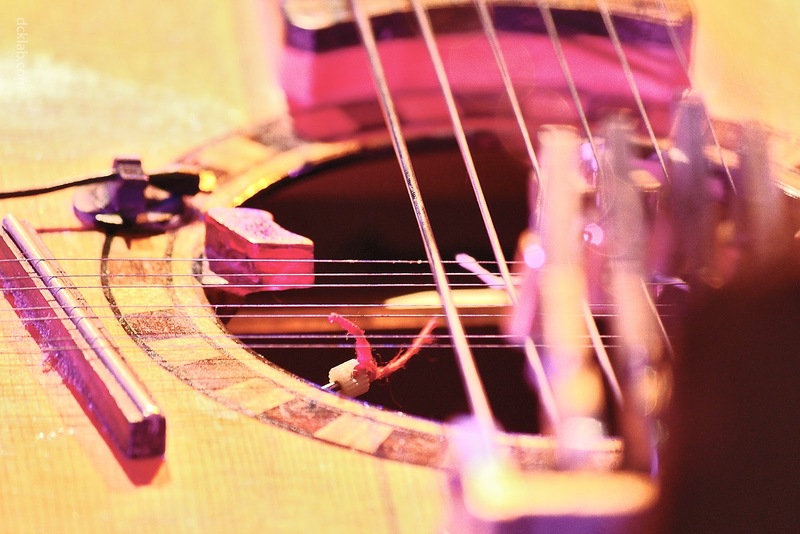 A bridge like a cello, a neck like a guitar, a more practical pedals system to actions my hammers. Just to have more funtcionality on my guitar is enough. I like to fish, and I love to cook! It's a great form of art. I love photography, reportage, probably my favorite disciplines besides the music. The sea, to stay alone in the night between the Islands in the sea of my village from where I came from: Palau. There are twelve Islands in between and it's amazing to spend time there. Also, looking for mushrooms in the forest. I love to do it and then cook what would arrive from sea and forest. It's great to look for food in the nature and cook it. I like if it arrives as fast as possible to my stomach. Jajajaja!! I'm 44. This mean at 14? I was loving the music exactly with the same intensity of today. I don't care about career, I believe in music and I think we are artisans, we need to have some money to pay the rent like all the people in the world. I started to dream in becoming a musician when I was 12. But until 23 I never suppose I could live only playing concerts. Human quality. I detest to play with people if there is not human complicity. Then there is music and the most important is relation with the beat: I need it in the music. Björk, Tom Cora and Paco de Lucia. 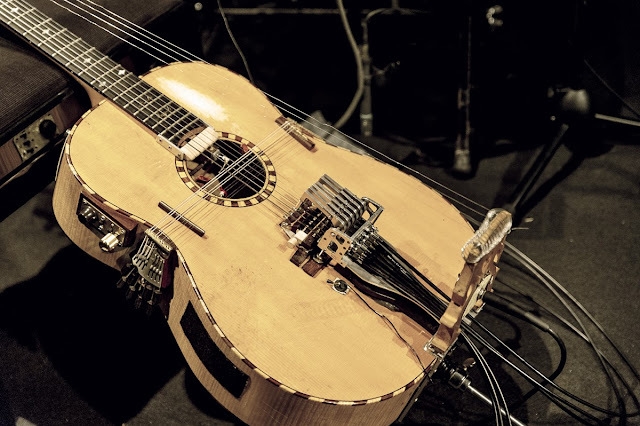 My prepared sardinian guitar, with 18 strings, hammers like piano, 8 propellers, extra bridges, etc, with a crazy system would allow to spatialize each string and use differents effects for each string. The privilege to do what I really love, to travel and discover how is great this planet and how many different cultures live here. To meet people and know their story and start to have friends in each part of the world sharing and discovering new musics. The Solo is my main one. Piccola Orchestra Gagarin would record a new album on next month, the duo with Iva Bittova is going to start with frequency on next year, duo with great mongolian singer Enkhjargal Dandarvaanchig.